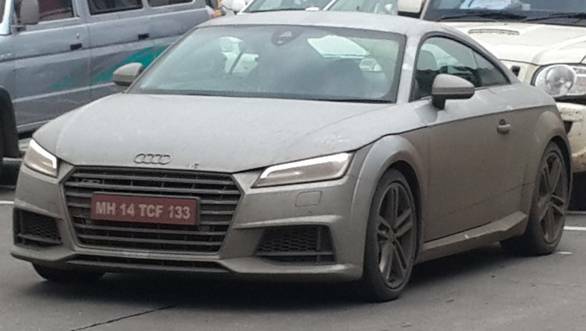 We recently came across the test mules of the 2015 Audi TT being tested in India. However, when asked, the folks at Audi India assured us that the test cars don't belong to them. Sounds fair, since the mules have been spotted for over three months now and considering that if and when Audi does bring the car to India, it will be a CBU and so the carmaker doesn't necessarily need to invest heavily in its homologation. The cars could therefore have been assigned to a testing agency for some specific technical or country-specific evaluation and likely to be commissioned directly or indirectly by the Volkswagen group itself or by some other carmaker. Interestingly, the 2015 Audi TT is available with a 2.0-litre TDI diesel engine that puts out 184PS of power and 380Nm of torque. With this mill having proven its mettle in India already, it could make for a sensible option to have in the TT line-up for India. The petrol options comprise of a 2.0-litre TFSI engine in two states of tune at 230PS and 310PS. The third generation TT has a new design direction and a lighter chassis. Audi adds that at least for the next couple of months, there are no plans for the TT in India - while this means that the third generation TT won't come to India this year, it does hint towards an early 2015 launch. Watch this space for our video of the test mules in action.